My attempts at curing green olives have not always been successful. The methods that I had heard about from farmers in Italy involved putting the olives in a salt water brine – though the amount of salt varied wildly – or washing the olives daily for months, and paying the ensuing water bill. In fact, after throwing out my third batch of ghastly smelling soggy olives that I was too afraid to taste,  I decided to give up on curing green olives. Place the olives with their incisions in a non-reactive bowl with the finely chopped carrot and celery. Add the salt, water, and enough vinegar to cover the olives. (If you have a larger amount of olives than this recipe, increase the water and salt accordingly.) Mix well and cover with a paper napkin. Stir the contents of the bowl once or twice a day. After 4 days, the olives should have darkened to a fairly uniform dark green color, and become soft (but not mushy.) If they are still hard, wait another day. Drain the olive/vinegar mixture in a colander. Make sure that you drain the mixture very well-wait a few minutes and toss the olives in the colander to get rid of excess liquid. Put the drained olive mixture in a clean storage jar (1 ½ – 2 qt or 1 ½ to 2 liters) and cover the olive mixture with good olive oil. Make sure the oil covers the olives so that they are completely submerged. The olives should not rise above the oil or they will spoil. Now comes the hard part – waiting. Place the jar of olives in a cool dark place and let them rest for at least 2 months before tasting. 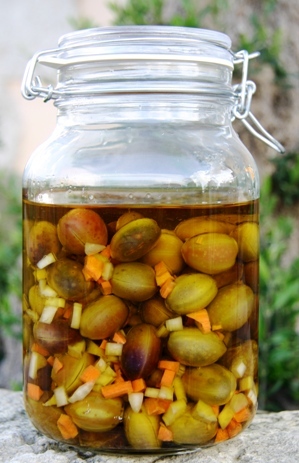 The olives should have a pleasantly acidic taste from the vinegar, which has been balanced by the oil.